The use of natural oil to improve lackluster hair has recently skyrocketed. With so many different brands, varieties and results, it’s difficult to know which to try. College Gloss has compiled a short guide to help your decision go smoothly. Argan oil (Argania Spinosa Kernel Oil) has become one of the most popular hair oils on the market and has earned the nickname “liquid gold.” It is derived from the kernels of the argan tree, well known in Morocco. Its nutritive properties come from Omega 9, Oleic, Linoleic, Vitamin E and unsaturated fatty acids. Numerous drugstore hair brands have adopted their own unique spin on this best-selling hair oil. Typically amber in color, this oil is a great pre-blow dry treatment, as it helps to seal the hair cuticle while nourishing and providing a smooth texture. The oil also helps heat hair to cut blow dry time. Macadamia oil (Macadamia Ternifolia Seed Oil) is derived from macadamia nuts, which are native to Australia. Making its mark as a miracle oil more recently than argan oil, it’s another oil that has luscious restoring properties for your locks. It’s designed to smooth and shine while providing UV protection and reducing drying time. The most recognized brand selling macadamia oil products is Macadamia Natural Oil, which comes in green and brown packaging. The Macadamia Natural Oil product line features a wide range of products from cleansing to conditioning to styling. The brand combines both macadamia oil and argan oil to make their products. The macadamia oil on its own is very lightweight, so by combining the oils, their power increases and positive results increase. 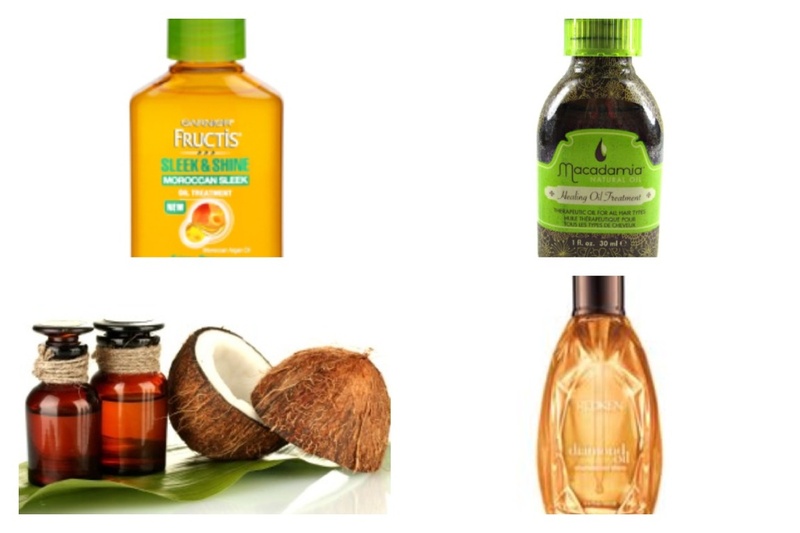 Coconut oil is known for being a multi-purpose essential. Besides being used for skin and hair care, it’s also used as a disease prevention and digestive aid, stress reducer and weight loss companion. This hydrophobic oil repels water, which makes it a great pre-wash hair treatment because by preventing water from absorbing into each strand, the risk of damage or breakage is decreased. It is also known for decreasing dandruff, eliminating lice, fighting frizz, providing protein to the hair and encouraging regrowth for longer, stronger hair. The do-it-all product is often found in a solid state, rather than liquid, as that’s its natural from. It melts with the warmth of your hand at just over 70 degrees Fahrenheit. So simply rub a small portion of the solid formula in your hands, then smooth it into your hair. You can find it in the cooking aisle of your local or speciality grocery store. CostCo also has a large tub for a cheap way to stock this beauty product in your own bathroom. Best-selling, high-end hair care brand Redken released their oil combo powerhouse called Shatterproof Shine Diamond Oil earlier this year. The oil “utilizes an exclusive formula of silicone free hair oils that include camelina oil, coriander oil, apricot oil, olive oil, jojoba oil, coconut oil and others to strengthen hair from the inside-out,” according to Redken’s website. It’s unique due to the fact that it targets all layers of the hair for optimal protection and shine. It helps to protect hair from breakage while providing a light, intriguing scent. Although olive oil is not sold on its own as a hair care product, it is still worth mentioning. It’s one of nature’s top emollients that can penetrate the hair better than other oils, and it’s super moisturizing while also being lightweight. It’s a great choice for girls with allergies, sensitive skin or a sensitive scalp because it’s not likely to cause an allergic reaction. Like coconut oil, olive oil prevents dandruff by promoting scalp health. It also contains Vitamin E, which acts as a powerful antioxidant for hair growth. If you’re not comfortable going for the pure oil itself, use a product that incorporates its sleek and shine benefits, such as Organic Root Stimulator's Olive Oil Moisturizing Hair Lotion ($5). By using one of these oils on a regular basis, or even mixing it up by trying each of them, your hair is guaranteed to become healthier and more nourished. If you’re dealing with constant frizz and lack of shine and you have a bit of extra cash to spend, try argan oil, macadamia oil or diamond oil. If you simply want to moisturize and nourish your hair naturally, or if you’re on a tight budget, try olive oil or coconut oil.